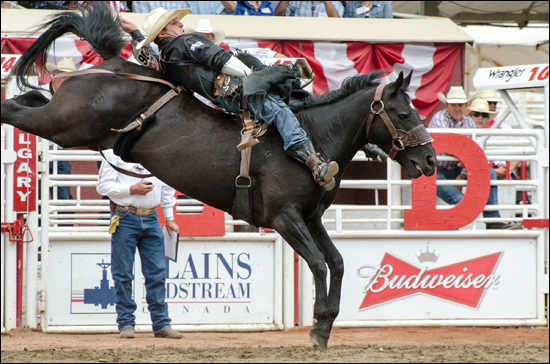 As the Calgary Stampede completes its first weekend after a heroic effort by volunteers, organizers and workers to overcome the devastation of the June flood, there’s a heightened awareness of the importance of tourism to the city. Had the flooding occurred a week later, the Stampede very likely would have been wiped out, jeopardizing one quarter of the city’s annual tourism income. Disasters reveal vulnerabilities, not just in infrastructure and urban planning, but in economics, as well. The flood in Alberta indicates a need for more significant tourism draws to the city. The Stampede, now in its 101st year, created $340 million in economic impact last year, when it welcomed a record 1.5 million visitors. Tourism totals $1.4 billion and attracts 5.2 million visitors each year inCalgary. For a city of more than one million people, having one event account for 25% of tourism is far too high of a percentage. In contrast, the Montreal Jazz Festival and Just for Laughs comedy festival — which both bring in more than $100 million in spending to Quebec’s largest city — are each responsible for about 5% of the metropolitan area’s $2.4-billion annual tourism industry. Even if either one was as large as the Stampede, it still wouldn’t be responsible for a quarter of the share of tourism spending. Likewise, if either one was cancelled for whatever reason, the loss wouldn’t cut so deep because other international festivals exist in Montreal. If there’s a lesson for the city and tourism operators in Calgary to take away from the flood it might be that now’s the time to dramatically diversify event offerings to have another giant festival that attracts global attention. In my mind, the surest way to make an immediate and sustained impact is through launching an annual Calgary Winter Stampede. Such an event accomplishes several objectives for Tourism Calgary and mayor Naheed Nenshi. It adds another significant event to the annual calendar to entice visitors and generate revenue. It boosts employment in the tourism sector, which currently employs 10% of Calgarians. It allows for another way to demonstrate Calgary’s astounding community spirit. A Calgary Winter Stampede takes advantage of the city’s best-known brand, “the Greatest Show on Earth” itself, and allows the city to capitalize on the winter sports traffic to its airport, where skiers and snowboarders land en route to the Canadian Rockies. MONTREAL — Soft, sugary, sweet and so guilt-inducing they’ll sentence you to the gym for a week, at least. The Jelly Doughnuts at the most talked about new restaurant in Montreal, if not Canada, are deliriously tasty, as well as a reminder that Le Bremner is a fun, casual place, no matter all the buzz about it and its celeb chef. 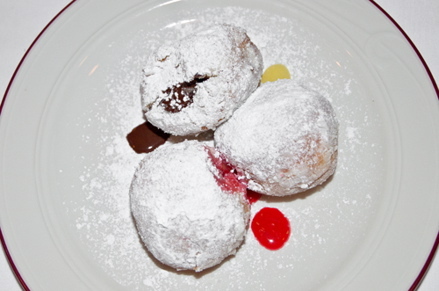 The doughnuts come three to a plate, each filled with a different creamy, gooey centre. These are Timbits on steroids — and after a serious retool in a masterful kitchen. Whether it’s the chocolate, lemon or fruity jam flavour, the Le Bremner doughnuts satisfy your craving for sweets and do it in a way that’ll make you smile — which is what a great dessert should do. It’s a playful dish, as well as a delicious one. MONTREAL–It’s minus-35C with the wind chill and Nicolas Cournoyer sweats. He’s not alone. Around him more than 5,000 mostly young people kick and dance and hug and howl beneath a full moon that has looked down on the St. Lawrence River forever and not seen a scene like this on its banks. The coldest rave on the planet is called IglooFest and it’s the brainchild of Cournoyer, who’s managed a seemingly Olympian feat by enticing his fellow Montrealers, as well as many house music fans from around the world, to come outside in this weather. They’ve done so even on the most frigid day of winter when everyone from the authorities to their parents are telling them it’s too damn cold. “As long as you dress properly, you’ll enjoy it. If you dance and you’re together, you stay warm,” says Cournoyer, who wears a full-body snowsuit as he moves to the beat of DJ King Cannibal, a headliner from the U.K. spinning at Quai Jacques Cartier in the Old Port. “Excusez, pardon me, the phone.” Aline presses her palm on the sofa cushion and stands. As she shuffles away, her visibly exasperated guest closes his eyes and rubs his forehead. The phone hangs on a wall in the kitchen. The kitchen is through a doorway and the wall is red brick and jaggedy. More than once, Aline has scraped her knuckles against it when rushing to answer the ring. She did no harm to her hand this time, because she didn’t rush. In fact, she hasn’t rushed for a very long time; months, if she will let herself count. Call it experience or just knowing better. Aline takes her time and no longer carries a watch, a fact that lately results in phone calls like this one, from her sister, who tells her she is late. “Il est maintenant ici,” Aline says and tells her sister she will be even later for dinner, and no, she hasn’t decided if she will sign the papers, and no, Richard’s father hasn’t called. He’s on the other side of the country, what does he care? She replaces the phone and spots a tray of cookies and biscuits. The silver plate is dented in the middle, causing the snacks to slide to one side or the other when she places it in front of her guest. He is a lawyer — an American named Charbonneau, a surname Aline finds both curious and displeasing for the same reason: he doesn’t speak a word of French. He says thank you and, to make room for the tray, bunches his documents together on the table, a utilitarian box with drawers and a wooden top with so many scratches and imperfections Aline is certain a bright man like Charbonneau will suspect it was bought used. She again asks if he would like coffee, tea, any beverage, and with a wave of his hand, he again refuses, and Aline retakes her seat. He presents her with a form to sign and an outstretched pen held between his thumb and index finger to accomplish the task. Aline accepts neither. Rather, she chews a soft cookie while once more listening to his banter, his assertions that it’s the absolute right thing to do, for the simple reason no one else should ever have to endure what her son did, no parent should again have to suffer in the position she finds herself. The form creeps toward Aline, pushed by digits that are long and smooth, without the calluses that marked her son’s hands. With a feeling of surrender, of acquiescing to stubbornness, Aline presses her palm on top of the document and pulls, easily freeing it from Charbonneau’s tenuous grip. She rebuffs his pen, which is closer to her chin than she would like. A ballpoint is next to the cookies and biscuits. With no other goal than to relieve herself of this episode, she uses it to scribble her name beside the red “X” that sits on the legal paper like a target. The page ruffles as she thrusts it back across the table to Charbonneau without looking up. Her eyes rest off to the side, to a spot on the floor where sunlight radiates through her fern and philodendron and other flowerless plants, and their leaves cast shadows on the floor, bare hardwood. Sue them, she says to herself. Take their damn money.